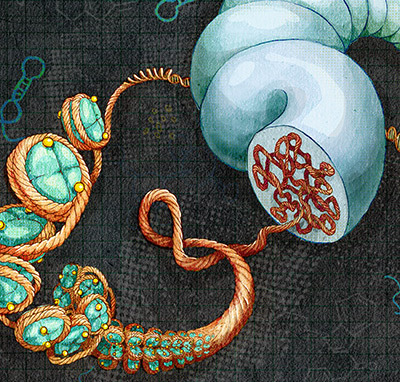 Master regulator: CHD8 regulates how the DNA in many autism risk genes winds around its support proteins. The results suggest that there may be more unidentified autism risk factors among the list of CHD8 targets. “CHD8 binding itself may provide additional power to find and detect [autism] risk genes,” says James Noonan, associate professor of genetics at Yale University, who presented the work. CHD8 dampens the expression of genes by regulating how tightly DNA winds around support proteins, called histones. In a 2012 study, researchers found spontaneous mutations in CHD8 in nine people with autism and none of nearly 800 controls1. They estimated that mutations in this gene might account for 0.4 percent of cases of autism. In the work presented Saturday, Noonan and his team looked at neurons from three sources to map all the spots in the genome at which CHD8 binds. They looked at human stem cells induced to become neurons and at neurons taken either from human postmortem fetal brains or from the developing mouse brain. Overall, CHD8 binds to sites at which genes are actively expressed, supporting its key role in gene regulation. The researchers then looked at a set of 116 autism risk genes, including 9 ‘high-confidence’ genes, meaning that they believe them to have a strong link to autism. CHD8 regulates significantly more of these than one would expect to find by chance, they found. CHD8 binds to 17 of 30 high-confidence risk genes (most of which are as yet unpublished) for which researchers have found at least two examples of a spontaneous, harmful mutation in an individual with autism. CHD8’s targets in this list include FOXP1, DYRK1A and ADNP. The researchers then grew neuronal stem cells that make little to no CHD8. This significantly changes the expression of CHD8’s targets, and in particular the autism risk genes, they found. “This is really pointing to a very strong regulatory role of CHD8 in the biology of other risk genes for autism,” says Noonan. For more reports from the 2014 International Meeting for Autism Research, please click here.